I want to wish each and every one of you a Happy and Joyful New Year. May you and your loved ones have a safe and wonderful holiday. Here is to a fantastic new year! I first became enchanted by mercury glass while antiquing in my former hometown 14 years ago. The antiques dealer whose store I used to frequent had a mantle inside the converted home lined with beautiful mercury glass candlesticks. Their lovely shapes were something to behold whenever one would walk into that store, but it was the way in which they gleamed so proudly that really caught my attention while perusing the countless antiques. Not knowing what these pieces were, I began to ask questions. I'm glad I did, because Lydia Gorohoff, quickly became my go-to source for wonderful collectibles as I began creating my home in Haddonfield. Born and raised in Germany, this astute antique dealer accumulated a lot while living in Europe. 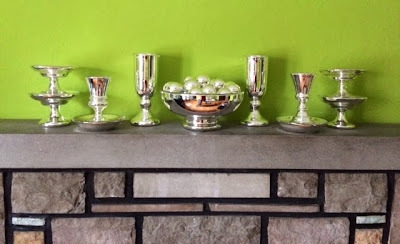 She and her husband brought many of their prized possessions when they emigrated to the United States and, lucky for me, among those pieces were her mercury glass candlesticks from Czechoslovakia. 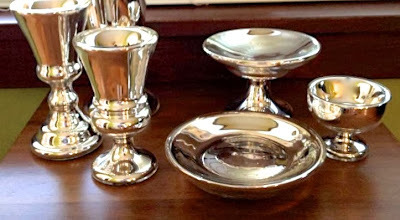 From around 1840 through the early 1930s, mercury glass (also known as silver glass) was produced in the Czech Republic (then known as Bohemia) in great quantities; it was also produced in England and for a brief period, in the United States. This freehand blown glass was distinguished by its double-walled design, in which the inner wall was colored with silver nitrate, and the pontil mark on the base of each piece was either covered with a plain cork & wax or a lead piece covered with glass. This plug was meant to keep air out of the inner wall. If the pieces, however, were mold blown, then they had no pontil scar. My photos, below, illustrate what I mean. While thinking about this post I had to go back and look at the mercury glass I had purchased many years ago. All of it was in storage and much to my chagrin, I hadn't laid eyes on it in over 6 years. I think I must have gasped when I opened the containers which had my candlesticks, because I once again realized that I had made some wise purchases. One of my readers shared some photographs of his prized pieces from Martha by Mail, which were produced for a very short period of time. I think you will agree that they are stunning pieces of glass. 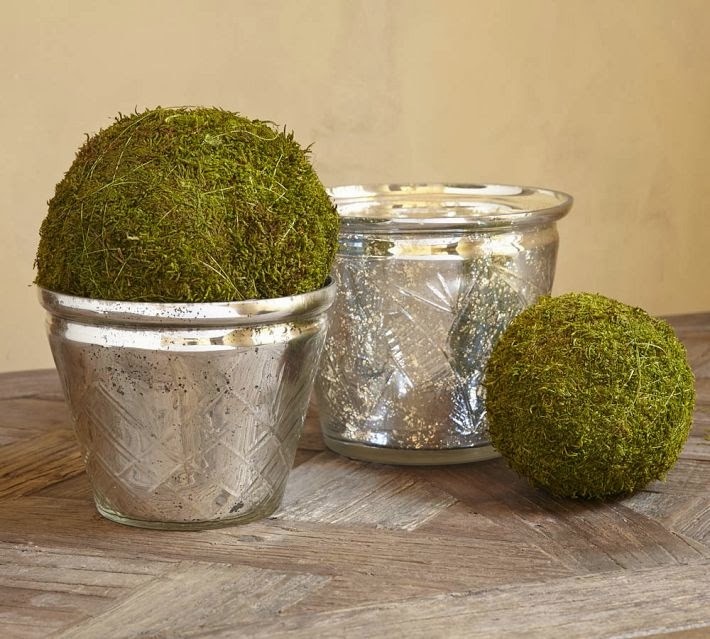 Begin your collection of mercury glass. These are my candlesticks ranging in size from a mere 4 inches to 12 inches. Although they aren't that large, they are rather hefty for their size. This photograph shows you what they look like from above. The larger one is already deteriorating around the rim. Luckily, the others are almost perfect pieces. The pair of 4" candlesticks with pewter tops have a raised design on them that is quite nice. They're small enough to use on one's table. At one point it was possible to order candlesticks, footed bowls, compotes, plates and even vases from Martha by Mail. The table setting above is from the former catalog. On the table there is Wedgwood Winterberries bone china, German silverware, tulip champagne glasses and of course, mercury glass. The large rose bowl makes a dramatic statement, while the candlesticks and smaller footed bowls provide a quiet elegance. Here is another image of that large footed bowl filled with faux sugared fruit. A small dish suitable for holding candles. Reader, Kevin Link, has a few of these pieces from the catalog. He says that they are among his most prized possessions. When they're not on display at an elegant table, Kevin uses them for decorating his home. For the holidays, Kevin proudly displayed his pieces on the mantle. Vases, compotes, plates and bowls were set against this bright & cheerful green wall. They are absolutely gorgeous. Another vignette from Martha by Mail shows that large footed bowl set on top of a plum-colored toile tablecloth. The plates are Wedgwood white bone china, the silverware is Bernini Italian silver-plate and the glassware is Juliska. Mercury glass butler's balls were also available through Martha by Mail for a few years. These were originally meant to be used by butler's in Victorian times to discreetly keep an eye on guests during a dinner without appearing to do so. On this demilune table, they act as decoration. This beautiful mercury glass table lamp with its wooden base and hexagon lampshade would be a great addition to any home. The lamp was designed after a story on repurposing objects for lamps was published in Martha Stewart Living magazine. These diminutive vases are meant to hold buds of garden flowers. Their bulbous shapes seem to call to mind antique perfume bottles. All contemporary pieces of mercury glass are not double walled, therefore they won't feel as substantial and hefty as the antique kind. However, they're equally beautiful and suitable for so many types of decor. Look closely. 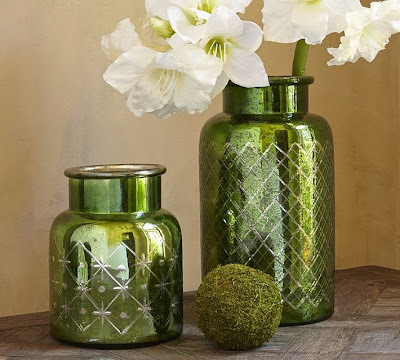 These contemporary pieces of mercury glass have a raised pattern and are given an antiqued look. I've noticed that many manufacturers have added this vintage element, which makes them seem as if they've been around for decades. Colored mercury glass is quite beautiful as well. 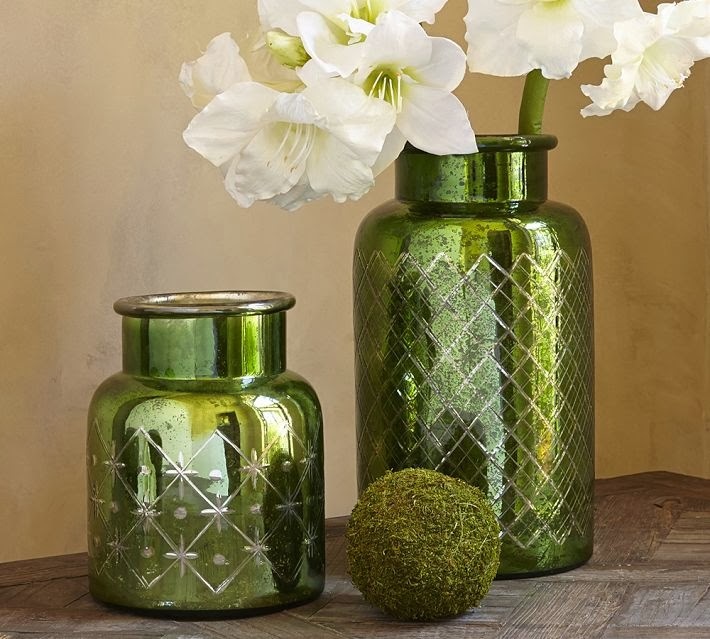 These two vases in the shapes of jars not only have an antiqued colored finish, but they also have an etched pattern that is ground into the glass. Whether you call it silver glass or mercury glass, if you're a collector of it or are thinking of collecting it, keep in mind that the condition of each piece (unplugged pieces will experience deterioration of the silvering agent over time, causing it to flake and crumble) and the rarity of the design, will have an affect in price. Moreover, etched designs, painting motifs and even colored pieces may command more than a plain & humble silver piece. 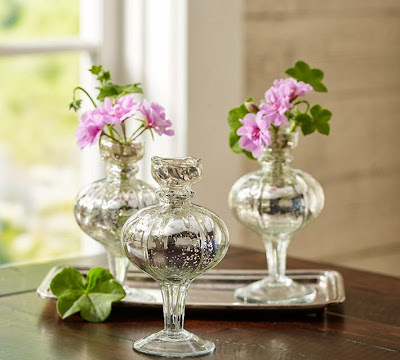 Lucky for us, though, many home design stores have been carrying contemporary pieces of mercury glass for quite some time, therefore it is possible to purchase wonderful home accessories in fresh designs, at decent price points today. My Christmas table setting was composed rather quickly this year. I was originally going to use reds and whites on the table, but pieces from my jadeite collection beckoned me to use greens for our dinner. As much as I love using my mid-century jadeite on a weekly basis, I had never thought of elevating this glassware to a more formal meal. After going through my inventory of glassware, linens and silverware, I did not hesitate to compose a table fit for this joyous holiday in my usual modest way. For the tablecloth, I chose a pale green, hemstitched linen. It’s nice mixing a place setting with different china, so this year it was no different. 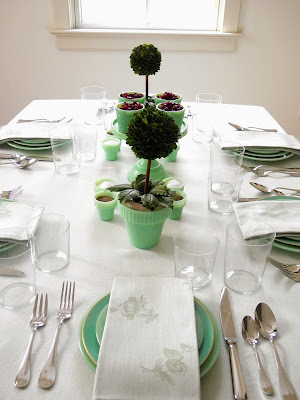 For the table, I used a mix of jadeite from the 1950s as well as some that was produced for Martha by Mail over a decade ago. That the pieces don’t match exactly is what’s so charming about doing this type of arrangement, and if you must know, I added some porcelain plates just to make it fun. Those too were from Martha by Mail. My centerpieces are always simple affairs, with items taken from nature being my go-to choices. I have a pair of beautiful boxwood topiaries which rest on rustic pots and thought they would be wonderful set on my table tucked inside some large jadeite flower pots. 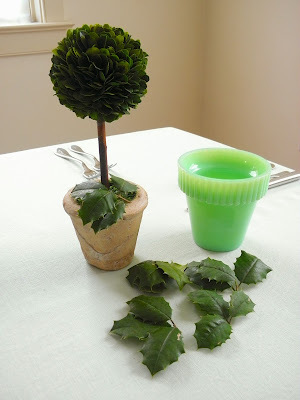 With this in mind, I gathered other beautiful jadeite pieces and began composing our Christmas table. It’s actually quite effortless when you think about it. These are the boxwood topiaries I was telling you about. and trimmed off a few branches so that I could use the leaves. order to hide the soil. flower pots from Martha by Mail. A perfect fit! I then gathered my other pieces of jadeite and began arranging. beautiful Antique Star Dessert Plates. They're such a nice pattern. Here is another photo of that Japanese porcelain plate. and a gilded star in the middle. It's exquisite for the holidays. placed in the center of the table. I filled the small vessels with bright red, dried cranberries. Martha by Mail jadeite cake stand. the green tones of the mid century jadeite. antique star plate, it's ready to be used for hors d'oeuvres. Here is a small overview of my Christmas table. and the silverware is gleaming! Thankfully it is bright and sunny today. I just love how the topiaries look on the table. Not too big and not too loud. It's always a pleasure to bake and ice cookies during the holidays, because it allows us to express our creativity using our best and favorite cookie cutters. This time-honored tradition is beloved by so many of us this time of year and I think you will agree, that the moment our loved ones near & far behold these edible creations, it makes all of that hard work worth it. The cookie cutters you use to create holiday cookies need not be priceless heirlooms, for just about any cutter can make exquisite cookies in festive shapes. Some of my friends have been sharing images of their cookies with me and I have to say that I’m thrilled with everyone’s artistry. It’s amazing what a little icing and some sugar can do to a cookie! Here at home, once my dozens of cookies have baked and cooled, I tint royal icing in batches, thinning out for flooding as I go. Once I have gathered the icings, sugars, sprinkles and other edible decorations, then it's time to express a bit of artistry, creativity and skill. For me, this is when the fun begins. If you want to see what I’ve done this year, please go through these photographs of the edible creations I’m sharing with my loved ones and apply an idea or two to your cookie decorating. This is the type of project you will want to undertake once you’ve finished wrapping the last gift and tucked it under the Christmas tree. There is still plenty of time to bake and ice a batch of cookies! This set of winter cookies is done in a simple white and aqua theme. Each cookie was embellished with either sanding sugar and/or edible candies. The stocking is as easy as can be. Outline and flood the cuff of the boot in pale aqua and evenly place snowflake candies along the middle. Outline and flood the boot in white royal icing and while still wet, pipe aqua dots down the middle. Carefully place pearl candies over each dot. Let everything dry completely. Outline and flood the candy cane in pale aqua and place snowflake candies down the pole. While still wet, flock the entire cookie in clear sanding sugar. Let dry. Each snowflake is unique. Outline and flood a snowflake cookie in aqua royal icing and place snowflake & pearl candies in a symmetrical pattern. Let dry. For the winter evergreen, outline and flood the cookie in pale aqua royal icing and haphazardly place pearl candies throughout the cookie to mimic ornaments. Outline and flood the trunk of the tree in white royal icing. The adorable Beehive Cookie Cutter that I designed for Heritage Home was used to make Winter Hives. It seems as if the bees were busy decorating their hive this year, doesn't it? The outside of the hive was outlined and flooded with aqua royal icing and was flocked with fine sanding sugar to make it appear frosty. The bees then piped dots of royal icing in a large circle and placed holly leaf and holly berry candies to make a wreath. A brighter palette of colors was used to create this batch of cookies. About a week ago, I made small snowmen for various individuals which were adored by those who got them. This larger version was made in the same style. I outlined and flooded the hat in black royal icing and placed two holly candies and two berry candies for a bit of flair. The snowman was then outlined and flooded in white royal icing; while wet, I placed an orange jimmy for a nose. This was left to dry completely. Black dots for eyes and a smiling mouth were piped over the dry base. Red royal icing was used to outline and fill a beautiful scarf which was embellished with snowflake candies and red jimmies to mimic a "fringe". The body was then given green buttons with pearl candies. The Christmas tree was a simple green royal icing with pearl candies. The candy cane on top was outlined and filled with white royal icing and was then flocked with green sanding sugar. Red royal icing lines were piped on an angle and green dots were placed between each space. This was then left to dry. The bottom candy cane was iced in red royal icing and while still wet, I placed holly leaf candies in a downward pattern and then added white pearl candies. Here is another version of that adorable snowman and another version of a candy cane and Christmas tree cookie. Simple, yet utterly of the season. These cookies were pure whimsy! I couldn't help adding more bees & hives to my holiday gift giving. Who says there can't be a holiday Bee & Hive? This particular beehive was iced in a forest green royal icing and was then flocked with fine sanding sugar. A giant wreath was placed in the middle. To make the wreath, pipe two thick circles of royal icing in either red or green and then cover it entirely with green & red pearl candies. The adorable "Hollyday Bees" are as simple as can be. Pipe a small red body and immediately place two holly leaves for wings. For eyes, drop two tiny white nonpareils. I guarantee you will have people buzzing after these cookies. Growing up, mom always used to hang our holiday stockings by the tree. We had red and white ones, but we also had a set of handcrafted ones that were given to us one year. I tried to reinvent those stockings with these cookies. Outline and flood the cuffs and boots in different colors and then either drop snowflake candies or white pearl candies in a nice pattern. You can also add dots of alternating color to the cuff and boot (while still wet) and then drag a toothpick to make a bleeding hearts pattern. Something tells me that my little ones are going to love the various wintery shapes and festive colors of the cookies. As Christmas approaches, I thought I would use a favorite cookie cutter of mine to create some jolly snowmen for a few friends. Over the last few days I've cut and baked dozens of holiday shapes that I plan on packaging up for individuals right before the 25th, but it's these snowmen that first caught my attention when it came time to decorate. The snow here in eastern Pennsylvania has been coming down about once a week, and on my drives around town I've noticed several snowmen cropping up on people's lawns here & there. It's always nice to see those jolly creations because it reminds me of the handful of snowmen I created with my brothers and neighbors when we were kids. Does one put a scarf on the fellow along with a top hat? It definitely needs a carrot nose and coal-black eyes, if anything, but what one embellishes the rest of the sculpture with is entirely up to the person creating it. It's the same idea when icing some snowmen cookies. With every cookie decorating project that I embark on, I approach it much like I do my cooking. I first begin by baking the cookies, mixing & coloring the icing and then getting my cookie 'mise en place' together. Every sanding sugar, every candy decoration and every single tool I'll need gets placed near my decorating station before I begin. This is what I did over the latter part of the weekend. I hope all of you are baking a lot of cookies! Here is my cookie decorating station that I've made for myself for this project. Everything is within easy reach and all is laid out in one area. This makes icing cookies so much easier. Sanding sugars in various holiday colors are decanted and placed into some of my jadeite bowls. I add a small spoon to each bowl so that I can quickly and easily pick up the sugar to sprinkle over a cookie if I need it. I showed someone a photograph of what I was doing and they asked what the tweezers were for. Well, those handy little tools are used to pick up the smallest of candies so that they can be dropped and placed anywhere on the cookie. This makes one's work more precise. The toothpicks are there to unclog any pastry tips or to swirl a design on a flooded cookie. For my Christmas cookies, I took out some pearl candies, some green & red medium-sized nonpareils, the tiniest and whitest of nonpareils and some adorable holly leaves with berries. 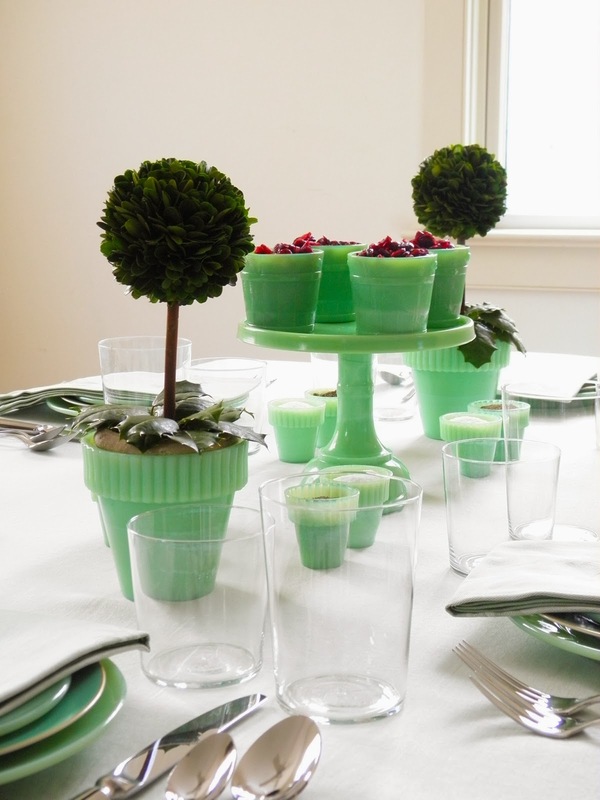 The candies were placed in reproduction jadeite flower pots from Martha by Mail. I set out to create two sets of snowmen for two different individuals who are dear to me. The row of snowmen on top were given black top hats with a holly leaf embellishment, black eyes, a carrot nose, a fancy scarf and cute green buttons. All of this was done over white royal icing. Half of the cookies were flocked with clear sanding sugar (for an icy effect) and half were not. I love how the green buttons give these snowmen a festive and cheerful glow. I think the recipient is going to enjoy the little army I created. The fellows on the bottom row were given the same basic treatments of decoration, but because I had a special request from my friend, I placed 'branch arms' on the little guys and made them hold a wrapped present. Here is a close up of them. Since these adorable frosty snowmen are meant as gifts for my friend's great niece and nephew, they just had to hold a little present. I hope they like them! for your loved ones this holiday season.